After all the hype, the new season of the Premier League started in well, to be perfectly honest, underwhelming style. 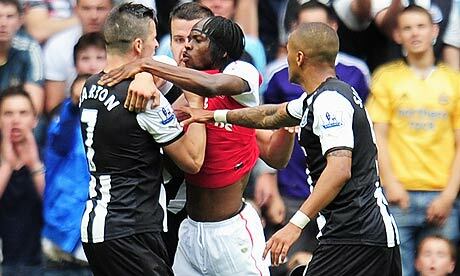 One of the moments that did make my ears of footballing controversy prick up was the school-boy scuffle between Joey Barton and Gervinho. I am slightly risking the wrath of some of my Arsenal-supporting compatriots here but I believe that the referee and the FA commission were entirely correct with their judgements of a red card and the subsequent three match ban. Whether you believe what Joey Barton did was right or not, the way the red card rule has been interpreted for the the last few years means that raising your hands in a violent action will lead to a red card. This brings us to a term which has been bandied around a lot recently. As I sat in a quaint if slightly decaying pub inNorth Londonon Saturday the man next to me kept muttering after the incident that “referees have no common sense these days”. Although he looked as if he may have been sat in the same seat for the past forty years, he was repeating words I have heard on many occasions from various people referring to the state of refereeing. The idea of referees applying common sense to their judgements sounds good in principle. Gervinho did not strike Barton with much intent and it was certainly not a danger to his health so perhaps it was not violent conduct that should be conducive of a red card. Different situations require different tact. The problem with this is, and unfortunately in my opinion will always be, that everyone’s idea of what common sense entails is diverse and sometimes diametric. This inevitably leads to the other rather contradictory term that perennial referee-bashers use, consistency. Referees are, of course, influenced by situations and atmospheres. I think the only way to ensure consistency across and in games is to have a set of rules that do not allow referees much choice in their decisions and for me there is very little room for common sense. The second point resulting from this incident came in Barton’s response to it. He readily admitted have gone down very easily – I think to be honest he was a little embarrassed by his actions. What he did say was interesting though. “He’s actually struck me in the face, and my issue is, if I don’t go down, and it’s clear the officials didn’t see what went on exactly. If I don’t go down and he doesn’t get sent off, I’m making my own team suffer”. This argument is identical to the one that players use if they have dived – contact has been made but the penalty will only be given if the forward goes down. It is worrying that footballers are worried that they are letting their team down if they don’t bend and break rules to secure a decision. You would think this means that Barton would feel let down himself, if one of his team-mates did not perform the same stunt when called upon. That is not just an ego-driven need to be the centre of attention but a reinforcing mechanism built through the collective, which ingrain these incidents within the game itself and not just within a few individuals. This entry was posted in Football and tagged Arsenal, Gervinho, Joey Barton, Newcastle, The Premier League. Bookmark the permalink. I had this same argumenty with my Dad, who agreed with the decision. I argued it is pathetic and nothing footballers do is particularly violent as they are all such fairies… However he made a good point and ultimately won the argument. They are role models and you cant have kids thinking it is ok to slap another kid on the pitch or push their head against the other like 2 stags fighting… In a world where kids take so much inluence from films, and media of various guises and not from parents or suitable role models we need to stamp out (no pun intended) childish behaviour from footballers. Barton is 100% right though, you dont get anything unless you go down or appeal. Imagine a match where noone screamed at the ref in appeal i reckon the whistle would barely be blown.